Reading about this massive lake in Siberia called lake Baikal made me wonder. After having stayed in Ulaanbaaatar for a few weeks I decided that I was too close to the lake Baikal and I had to go there. The journey from Ulaanbaatar to the lake Baikal is more than 1200km, due to the time frame and that Susanne was not coming I decided on a bus and train ride there. Before I could leave Mongolia I needed a Russian visa which is infamous for being a hard nut. I read around on the internet and found the webpage of the Russian embassy in Ulaanbaatar. The web page contained the information I needed. First an invitation from Russia, was found here and then fill in the form from the embassy webpage, good to go. Went there and got the papers sorted, okay was not that easy because my invitation letter or tourist voucher as it is called had the wrong dates. After a few mixups as now it was Mongolian new years, the Tsagaan Sar, and banks were closed, paying was then difficult. In the end I got it and was very simple in fact only due to my own mixups made it a bit complicated, the employees at the embassy were very helpful and friendly. With a borrowed backpack on my back packed with tent and needed equipment to explore the wild Siberia I jumped on the bus to Ulan Ude in Russia a 12hours bus ride, it has been a long time since I have been on a bus for this long not since Iran. Stayed a night at the Travellers House hostel in Ulan Ude. The next day I went to the train station and booked a ticket for the afternoon to Irkutsk. Yes Irkutsk a city I can really relate to Siberia and the trans Siberian railway. Had time to wander around Ulan Ude a city which is the capital of the Buryat region. A small city with nice wooden houses and likeable people. It is one of the few places in Russia where buddhism is a major religion. The Trans Siberian railway connecting the east and west of Russia, it has the same ring to it as the silk road or at least it is well known. An 8 hour ride to Irkutsk now this is more Russian with great churches and more Russian spoken. Arriving late to the hostel and arranged to go to the island of Olkhon a famous spot on the Baikal lake and another 5-6hours of a bus ride. Now I was already missing the freedom of riding the bicycle. On the bus to Olkhon I met two French sisters who were on a small trip to Siberia which is apparently becoming popular as I met others doing the same. Infrastructure is well arranged and you don’t have to deal with the cold as much as you might think. We arrived on the Island after driving across the ice in a small UAZ Russian make offroad minibus. To my surprise everybody had already booked their places to stay except me old fashion guy who likes to show up and find the place. This time it was a bad idea as it was Russian holiday and places were full. Well I had the tent so as a last resort I would just camp mind I say it is still fresh there around -25c at night. I went again to Nikita’s a known place on the Island and I met with Nikita himself, he arranged that I could sleep in the workers quarter which was nice a simple wooden room with my own fireplace and could eat with the workers. Perfect deal. I decided to stay three nights here and see what I could come up with. Nikita apparently was the one to start tourism on the Olkhon Island around 17 years ago. Back then it must have been a real adventure coming to the Island. Now electricity has arrived 10years ago I was told and many places have opened up for the steady stream of tourist coming from the Trans Siberian. Nikita’s is an all wooden compound and you can really get the feel of it evolving as there are houses being built with different structures. The wood carvings on the houses are quite impressive and gives a great feel. I found out that the reason Nikita’s places was fully booked was not only due to the holiday, infact there was a big French film crew or movie set staying. As I spoke with the crew, I learned that the movie they were shooting was based on a real story of a French adventurer who had lived in a hut next to the lake for 6 months and described his experience. I rented a mountain bike with studded tires and went exploring the whole day on the lake. What a place to cycle I really could feel the energy of this massive lake! The lake was breathing under me, the ice cracked and made some enormous loud sounds. 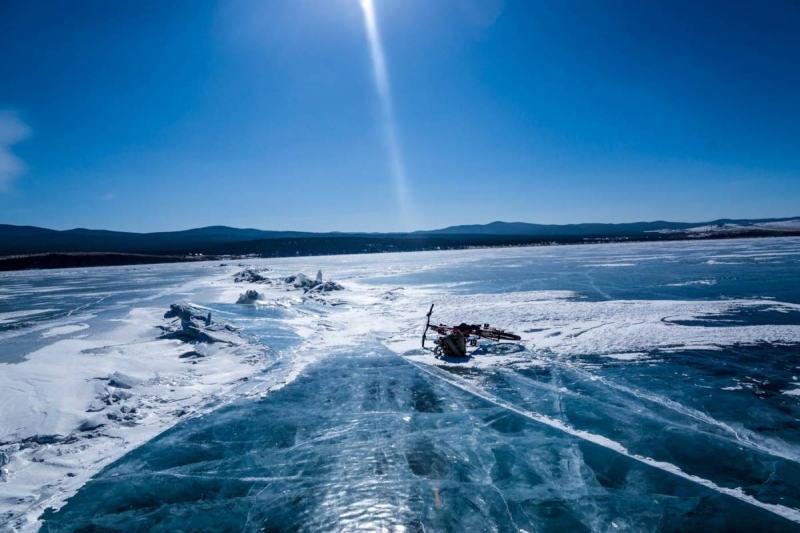 This would be great with Mojo and the full set up just cycle along on the ice of lake Baikal maybe another time as this time I could just enjoy that I was there and had made this choice to go there. It was hard to be out there on a day tour as I am used to having a goal and a destination of where to go and now I was was just there cycling on the ice. The experience was great but limited by myself somehow, I was there and I was enjoying but the same time I wished I was there with a goal, an idea! I switched of my wandering thoughts and pushed the pedals when I realised that maybe it would have been good to wear a helmet as I have been wearing one the last 17000km cycling on Mojo and now I was on pure ice?? Well had no helmet and didn’t think I would find one on the island. I cycled over big cracks in the 1-2 meter deep ice and in one my bike disappeared under me and I glided along on the ice…. Luckily I had just crashed the bicycle and it was sliding along behind me. Of course this happened as I was thinking of the helmet, right! Not hurt but with more respect for the ice and the cracks. The scenery was amazing really the sheer amount of ice and in the distance snow capped mountains. I relaxed again and cycled on further on the ice stopped for lunch which consisted of some sausage and bread I had packed. Stood there alone on the ice enjoying the solitude and the harsh nature. It was getting colder and windy so I decided to cycle back. On the way back the solitude changed as I got closer to the village Khuzhir. I met a group of Russians on a 7 day ice skating trip to the north of the lake I said goodby and cycled on then I came along some fishermen ice fishing. The site where they were sitting was scattered with small fish they had caught but were too small like 4-8cm and now just lying frozen next to these three men smoking their cigarettes on the icy lake. A group on motocross’ers with 5 cm spikes on their tires were on their way north in 4 days with 3 support pickups. What a noise they laid out on the peaceful lake. After these meetings I could understand that lake Baikal is becoming a destination for adventure tourism and infrastructure is ready. I cycle back to Nikita’s, posted a icy beard picture on facebook as I had some talks with Stephen from cyclingthesix back in Ulaanbaatar about this legendary photos of people with ice beards. This is fairly overrated as in right temperatures this phenomenon appears quite fast and doesn’t really tell the story. Anyway the photos are impressive and attracts attention, make me think of Mongolia in winter camping in the desert where the photos do not tell the story at all, see this photo and guess if it was cold or not? Had dinner with the lovely french sisters Laure and Maude at Olga’s homestay another popular place on the island. After some beers and good talks it was time to go home and sleep. Excursions what are these? I went on a tour on the lake as I hoped to see and learn more of this great nature. I was disappointed as we were filled in to the van 10 people and then we just drove around and stopped to see ice, no explanations or stories. Think some people enjoyed but I didn’t really. Places lose their power when just cruising through in a car, I have to be out there and feel it! I was leaving the next day so had a goodbye beer with the sisters and packed up my stuff. Coming back to Ulaanbaatar I had planned to do it in one go so 6 hours from Olkhon to Irkutsk, 8 hours Irkutsk to Ulan Ude, 12 hours Ulan Ude to Ulaanbaatar. This worked out but wow is tough this kind of transport. Looking forward to be back on the road and enjoy with Susanne. Was it worth it to go to lake Baikal like this? I think so as I have heard much about this place and it was a mystery. This is a remote place of the world but definitely getting more accessible!